Quaint and Quirky: Christmas Gift Wrapping - Ruffles! 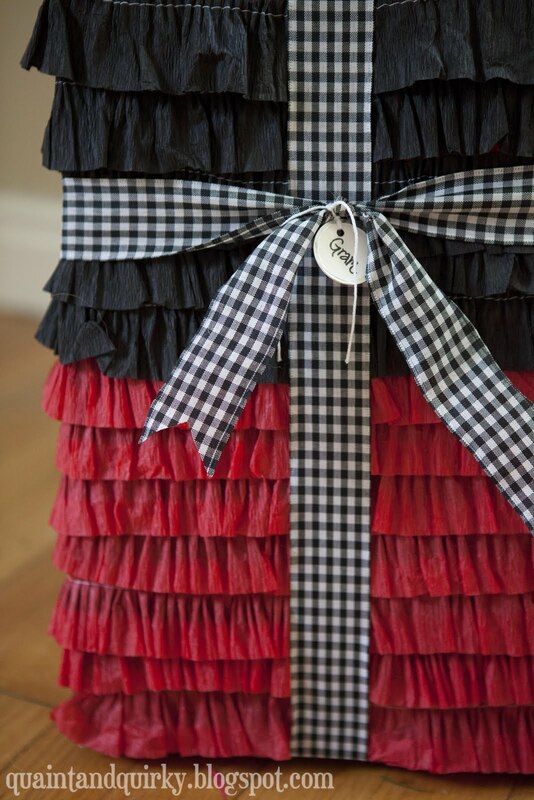 Christmas Gift Wrapping - Ruffles! 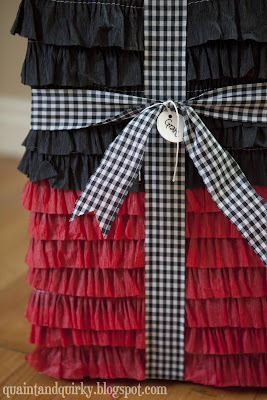 I'm sharing with you today a different and unique wrapping technique that you can use to jazz up a special present. I figured this out out of necessity when I needed to wrap a present one morning and had no wrapping paper that I liked around the house. I might be finicky about my present wrapping, but I have a wrapping reputation and I need to uphold it!! 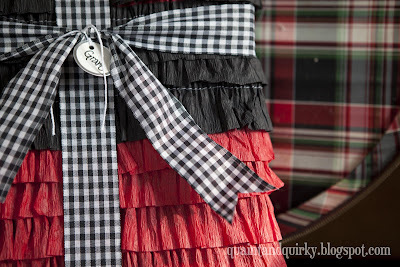 Anyway, I DID have miles and miles of these ruffled streamers that I made for Amelia's birthday party in a trash bag. I was pretty happy with the outcome, so here's the Christmas version! 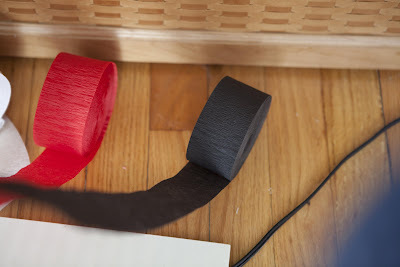 You need two spools of streamers, double stick tape, your box, and your sewing machine. I bought my streamers at the dollar store. Set your machine on a high tension. 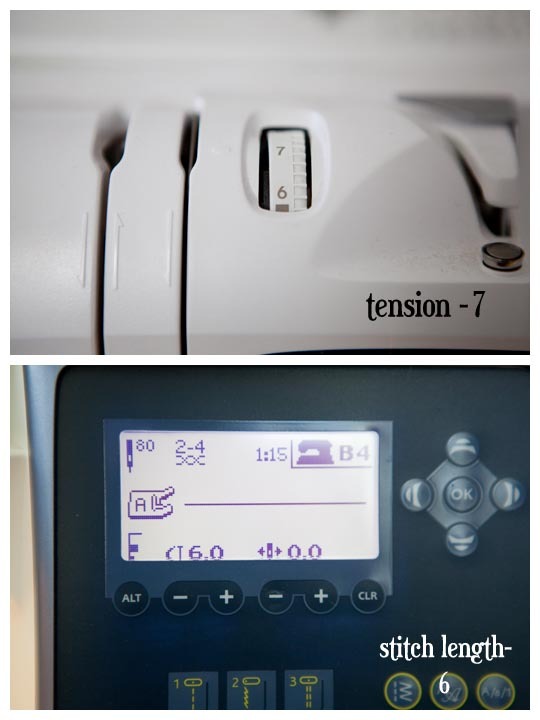 I found that 7 was a good tension. It gathered the streamers enough, but not too much that I lost a lot of length. Play around with it. 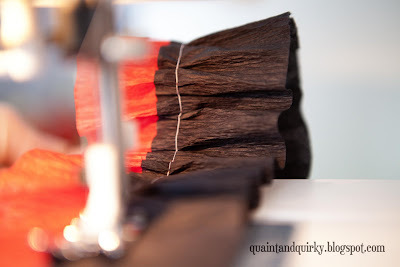 Set your stitch length as long as it will go. Make sure you have a FULL bobbin. You are going to need it! It will help them not get twisted! Learn from my mistakes, people! Overlap the two streamers and put the pedal to the metal! Just sew straight down the middle. 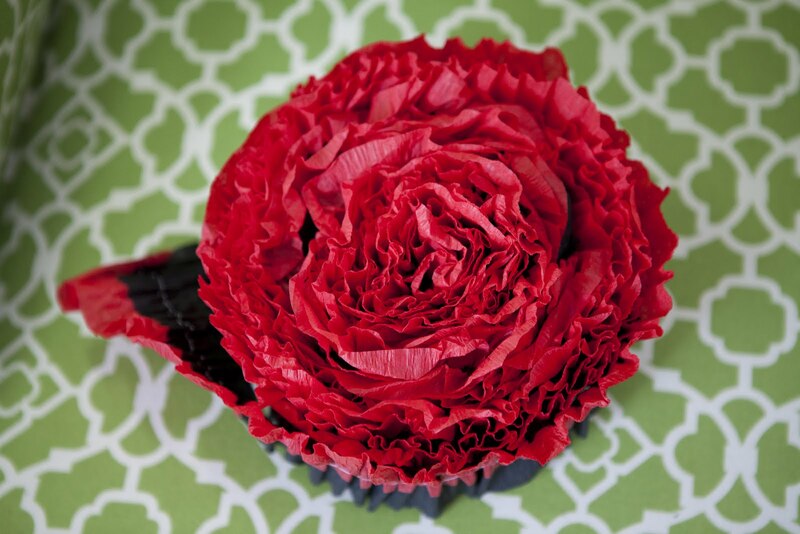 You'll see that it makes a nice ruffle as it comes out of the machine! Take a box, place some double stick tape on the bottom front. Attach the streamers to the box and just wind the streamers around the box from bottom to top! I place strategic pieces of double stick tape every once in a while. Tape at the top and you've wrapped your present! 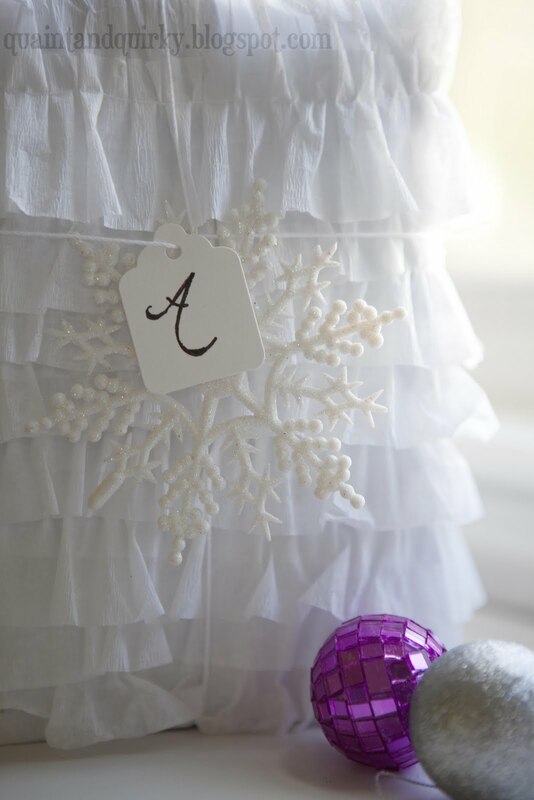 For the white presents, I used two spools of white streamers. 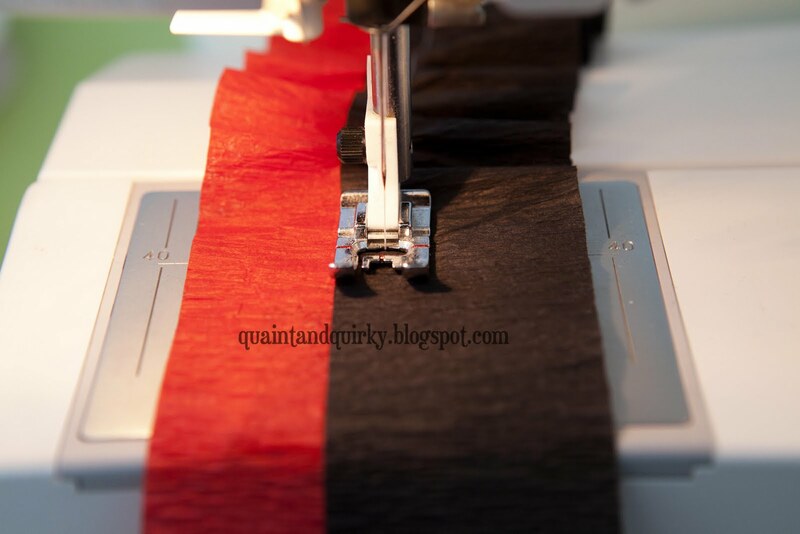 For the black and red one, I just started with the red down, then twisted it in the back half way up and continued with the black down. 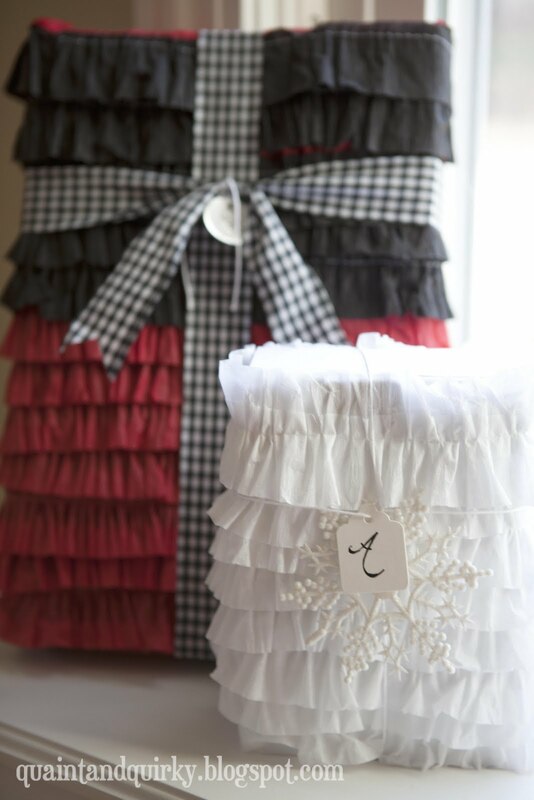 I hope you give someone a fancy ruffled present this Christmas! VERY cute! Thanks for sharing. Visiting via Tater Tots & Jello! 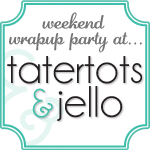 I'm glad I found you via Tater Tots & Jello! lovely...what a nice change from plain old wrapping paper!! I have a million rolls of streamers left over from a party...I am so doing this! How creative!! I love it. Would you link up to my party?? I'm featuring this today. I just love it! wow! great idea... I must try this! Thanks for sharing! I found you on TT&J! 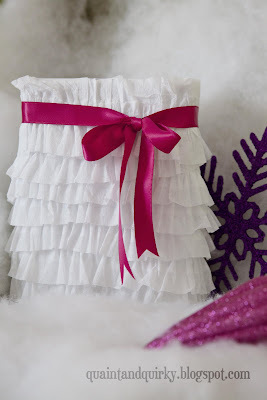 Would love for you to come by and link this up at my "Create and Inspire Linky! Thanks so much! WOW! That is seriously cool! I would never have guessed from first glance that those were streamers. Genius! So glad you shared this great idea at Shine On Fridays; hope you'll be back this week with more fabulousness!